Will Occupy Shut Down All West Coast Ports? westcoastportshutdown.org Around nine o’clock on the night of November 2, after more than 10,000 people marched to the Port of Oakland in support of Occupy Oakland’s call for a general strike, an independent arbitrator declared the port unsafe for its workers, effectively securing its closure for the rest of the night. This Monday, Occupy Oakland will try to best its 12-hour port shutdown with a more ambitious West Coast “port blockade” joined by more than a dozen occupations from Anchorage to San Diego. 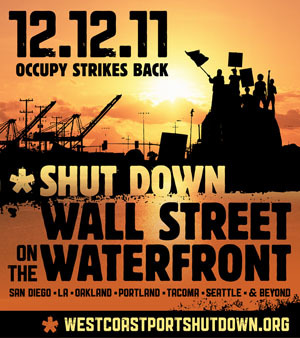 Occupy Oakland’s renewed call to shut down the “Wall Street on the waterfront” was sparked in large part by the October firing of 26 port truckers in Los Angeles and Long Beach who wore Teamster T-shirts to work in defiance of their anti-union employer, the Australian-owned Toll Group. Monday’s protests are also being billed as a protest against port terminals run by the Goldman Sachs-owned Stevedoring Services of America (SSA) and a show of solidarity with the International Longshore and Warehouse Union’s rank-and-file—particularly in Longview, Washington, where the union is engaged in a contract fight with Export Grain Terminal, a subsidiary of the agribusiness giant Bunge. Barucha Peller, a member of Occupy Oakland’s West Coast port shutdown coordinating committee, said Monday’s plans are an “unprecedented” stand for a movement that’s only three months old. Activists have learned from the previous shutdown, she believes, and will work to avoid repeating mistakes such as blocking truck drivers mistakenly thought to be incoming nonunion workers. “November 2 we were organizing on the fly,” she explained. “Now we’re communicating a lot better with the port truckers and flyering a lot more down at the port.” Both truckers and the ILWU members, she added, have had “really positive responses” to the plans. Stan Woods, a member of the ILWU Local 6 in San Francisco on Occupy Oakland’s port shutdown committee, believes that Monday’s plans are in line with the union’s decades-long history of picketing in support of social-justice causes (which former communications director Steve Stallone details here). “I have no doubt the national leadership believes what it says,” Woods said, “but the ILWU, despite its problems, is one of the most democratic unions, with lots of autonomy.” Solidarity strikes have been illegal since 1947, but ILWU workers have a history of protesting without official union sanction. In reality, though, the Occupy movement has no intention of actually trying to shut down all of the more than three dozen ports along the West Coast of the United States and Canada. According to the protest’s website, occupations in 14 coastal cities—including Los Angeles, Portland, Seattle, Tacoma, and Vancouver—will participate, but they don’t all plan to shut down their respective ports. The Port of Los Angeles, which adjoins the Port of Long Beach, is the nation’s largest with 43 miles of waterfront—too large to realistically bring to a halt. Michael Novick, a member of Occupy Los Angeles’ general strike preparation committee, said his group instead sees the protest as a “first step toward a general strike” in his city next May. Occupy LA, he said, only plans to picket at one or more SSA terminals at the two ports.